" Mike Morrow's ideas are practical and proven to work. In his presentation, he shares strategies that truly make professionals more effective. You can not help but be more successful by picking up on his ideas. " " As a mentor to more than 150 agents worldwide, I'm always looking for a way to give my people an edge out in the field. Mike's book is more than a good read. It's a great tool, but only if you're serious about your success. " " Knowing what to say is as important as how you say it. Mike Morrow has compiled practical and implementable ideas and concepts for virtually any situation. Learn these and you can increase your effectiveness and sales efficiency. " " Mike Morrow's MDRT presentation was phenomenal. I wrote down about 20 different sales ideas today. I would definitely suggest that he is an investment not an expense. " " Mike Morrow is one of the very few people I know who combines a natural and never-say-die enthusiasm with exceptional selling skills. If you are lucky enough to get to know Mike, you'll love his sense of humor, you'll share in his passion for the Financial Services business and you'll learn while you are doing it. Not only do I enjoy listening to Mike, I look forward to it. He just makes me feel better. I can't say that about many people. I know he'll do the same for you. Plus, Mike has this business down cold. He knows his stuff. If you are not yet good at sales, Mike will make you good. If you're good, he'll make you better. and he will definitely amp up your enthusiasm. That's one of the best returns on your time you will ever get. " " Mike brings a wealth of knowledge about how to help advisors grow their business. He delivers the material with enthusiasm, humor, and encouragement to become a better advisor. " " In Mike Morrow you have a lot of very simple subtle humor that reveals some very powerful truths about being a financial advisor in this world. You just gotta love him. " " The sessions by Mike Morrow were very very enjoyable. After being in the business for over ten years, there were a number of things I picked up that I can incorporate right into my business, using them immediately. " 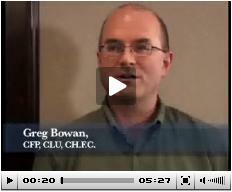 Greg Bowen, CFP CLU CH.F.C.
" I've been in the business for thirty years, and Michael Morrow brought a very refreshing approach that I'm definitely going to benefit from, and in the long run, my clients will definitely benefit from. It was great, one of the best sales conferences I've been to in years. " Mike Stewart, CFP CLU CH.F.C.
" What I really enjoyed about hearing Mike Morrow today is the value that I can take and use with my clients. This has been a phenomenal opportunity to see something that can help you grow. " " I think what I got today was how to go about doing this, the meat and potatoes. This was just fantastic. I think anybody who missed Mike Morrow today missed a great opportunity to learn how to grow their business and how to get ahead, and how to move beyond where they are right now. This was just a tremendous seminar. I'm gonna go with this and hit a home run. " " Michael Morrow knows what the media wants - honest, tell-it-like-it-is commentary that explains what complex events mean to everyday investors. " For more information about Mike, click here.